By now, most of us have heard, read or seen the recent story about Democratic state senator Ginny Burdick skipping out on her planned town hall by falsely claiming she had a “scheduling conflict.” Actually, she told a local reporter that, “Keeping my schedule would’ve been a conflict with common sense.” That in itself is explanation enough, Senator. But the story line quickly changed from the anti-gunnin’ pol skedaddling outta town before sundown to the fact that some nefarious citizen with a video camera parked on a public street caught Ginny keeping her schedule with her trash can, mailbox and reportedly, her TV remote. Then the blue ink flowed when Jeff Reynolds, the chair of the Multnomah County Republican Party, had the audacity to post the boring video as proof the senator’s clash with common sense was not quite as she told the public. See VictoriaTaft.com posts about Burdick here, here, here, here, here for starters. Even Jason Williams at Oregon Catalyst weighed in, irritating many conservatives, but thrilling the Left with his own criticism of staking out Burdick’s home to verify her reason for her no-show. But in fact, Williams is right, as are the Oregonian and TA Barnhart. As an elected official myself, I can empathize with Senator Burdick and her desire to be free of political harassment at home when not engaged in her elective duties. Speaking from firsthand experience, sending a lone videographer “Gunster” (Barnhart’s favorite term for 2nd Amendment supporters) to quietly and unobtrusively capture the senator performing routine household chores at her private residence was wrong. When they look back on it, all of those 2nd Amendment Gunsters, including the pack leader Jeff Reynolds, will come to realize that was the wrong thing to do as well. 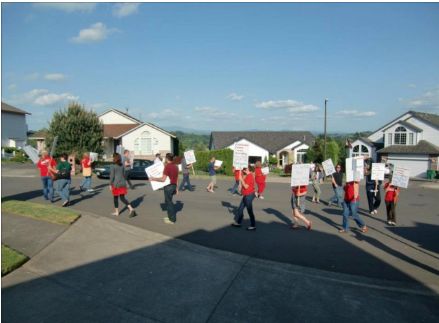 What they should have done instead is surround Burdick’s home with sign-carrying picketers, like the Oregon Education Association’s mobs did to conservative members of the Reynolds School Board last May. During the contentious contract negotiations with the Reynolds Education Association, the OEA affiliate decided that board member’s homes and families were fair game and legitimate targets in an overt act of union intimidation. My friend and colleague Joe Teeny had his home and neighbors’ cul-de-sac surrounded by union protesters, some of whom were identified in photographs as coming from Occupy Portland. While Joe and I were leaving to attend a board budget hearing, Mrs. Teeny was trying to leave their driveway with her children in the car to attend – of all things – a school function that evening. 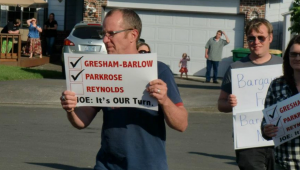 As she slowly backed out of her driveway, her terrorized children had to stare into the faces of Reynolds teachers and complete strangers, carrying signs that had their daddy’s name on them. At the Tewksbury home, current board chair Valerie Tewksbury’s children watched from upstairs as REA members stood outside their residence, chanting in a military cadence “Twisting facts and telling lies…making all the children cry!” Yes, the REA succeeded in making the children cry. f bullying and political intimidation. The rationale appeared to be that school board members are public officials and should expect pressure, including home visits from the union and the constant union-scripted, dinner time phone calls at home “urging” board members to settle up with the OEA, which has donated untold thousands to Democrats, including Burdick. I appreciate and empathize with Senator Burdick’s desire for privacy and to be free from political intimidation at her home. But where was she when her OEA benefactors showed up en masse outside the private residences of Reynolds board members, timed perfectly to coincide with the board members themselves attending a budget meeting? What do TA Barnhart and the Blue Oregon crew have to say to the Teeny and Tewksbury children, who will remember that May 17, 2012 evening for the rest of their lives? Senator Burdick may have convinced herself and her media allies that she is the victim here. But if she thinks being videotaped from across her street is political intimidation, the good senator is fortunate to have never been the recipient of a home visit from the OEA’s Gunsters at her home.